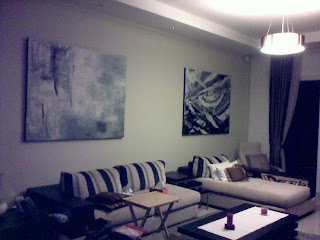 Hubby finally had the chance to put up my Black and White series paintings which I completed when I was 3 months pregnant. Some Chinese friends advised us against putting up paintings, hacking or renovations of any kind during pregnancy (some kind of bad luck). So we had to wait for post pregnancy before we could finally hang (drill on the wall). and u did this while u were pregnant? yes i was already pregnant when i made the paintings... thanks for dropping by!